Hello, my name is Gordon Goldsborough and, since early June, I've been the 49th President of the MHS. Little did I know all the responsibilities of the job when I agree to serve, one of which is writing this column. But rather than delve into any weighty issues this time around, I decided to give you a glimpse into my background, so you can know where I am coming from. Before I do, though, I want to offer sincere thanks to my predecessor, Steve Place, for his leadership of the past two years. I am a native Winnipegger, having spent my childhood in Charleswood. But I also have deep roots in rural Manitoba, being the grandson of farmers near Starbuck (my brother received a Centennial Farm designation in 2002) and Stephenfield. I like to think this gives me a broad perspective on Manitoba - I believe strongly, for instance, that the MHS has an obligation to reflect all parts of the province, not just those encompassed by the Perimeter Highway. Today, I live with my family in Winnipeg, literally within a stone's throw of the city limits. I travel regularly outside the city. I've been interested in Manitoba history for as long as I can remember - probably a result, in part, of my mother's influence - but I do not have a formal education in history. I am a scientist, having received bachelor and doctoral degrees in Botany from the University of Manitoba, with specialization in aquatic and wetland ecology. I am experienced in the botanical and chemical aspects of water quality, and I do research on the impacts of humans on the aquatic environment. I suppose you could say I am also an environmental historian because, among my research activities, I reconstruct trends in lake water quality, going back thousands of years, from information contained in their bottom sediments. I presently hold an appointment as Associate Professor of Botany at the University of Manitoba, and I am the Director of the University's Delta Marsh Field Station on Lake Manitoba. 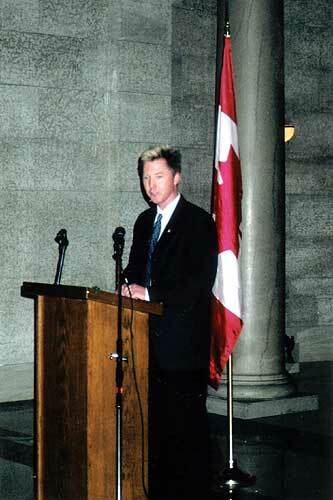 Prior to moving to the University in 1996, I worked for seven years at Brandon University and four years at the University of Alberta in Edmonton. 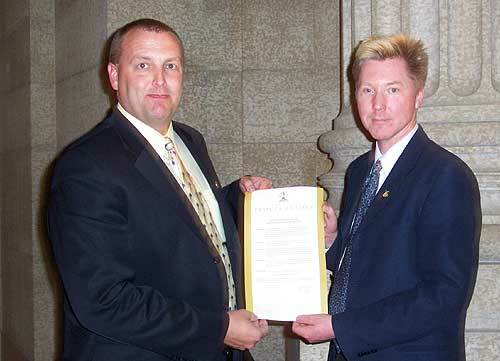 Before that, I was a Research Scientist with the Manitoba Department of Environment (now Manitoba Water Stewardship). I joined the MHS Executive Committee as First Vice-President in 2002. I tend to have a lot more ideas than I can see to fruition, but one that I am proud to say did happen soon after I became involved with the MHS was an expansion of our web site. I assumed the job of Webmaster and continue to push the Society to have an increasing presence on the World Wide Web. Through our digitization project, supported by grants from the provincial government and Canada's National History Society, a large collection of MHS publications - starting with the Transactions (1882-1980) and Manitoba Pageant (1956-1980) - are now freely accessible on the Internet. I have many more ideas for the web site, so stay tuned! I took the reins of the Dalnavert Management Committee in mid 2003, as plans were being formulated to construct the new Visitors Centre. I have passed them now to co-chairs Jim Blanchard and Stephanie Middagh who, along with an outstanding management team and an equally enthusiastic Dalnavert Advisory Group, promise to lead the museum into an exciting new period of growth. My own interest in history is diverse. As noted earlier, I study the long-term history of natural environments as a way of separating changes due to human influences from natural factors. I am presently working on two books, at least one of which I hope to see published in the next few years. One will deal with the environmental and cultural history of Delta Marsh, a world-famous duck hunting marsh and site of Manitoba's first cottage development. The other is a biography of former Winnipeg businessman and athlete, Donald H. Bain. I am interested in the history of science in Manitoba and, recently, I had the good fortune to study the personal and professional papers of Reginald Buller, one of the University's first professors, as the basis for a brief biography in Manitoba History. And, for reasons I cannot fully articulate, I am fascinated by Manitoba's cultural history in the late 19th and early 20th centuries, from about 1870 to 1920. (Perhaps it is because my great-grandfather, John F. Goldsbrough, arrived here from England in 1884 so my own connection to Manitoba traces back to this time.) In my spare time (huh! ), I am working on two projects that will, I hope, lead eventually to articles in Manitoba History: an analysis of early Manitoba automobile owners, and a directory of Winnipeg's early professional photographers. Finally, a warning: I intend to use these columns to put forward new ideas and, hopefully, to provoke discussion. I believe firmly that the MHS has a critical function but it can do more to perform that function. I am confident the MHS will celebrate its bicentennial in 2079, and I believe firmly that to guarantee this milestone, we must always remain open to new opportunities and projects, new approaches to old problems and, most especially, new members. 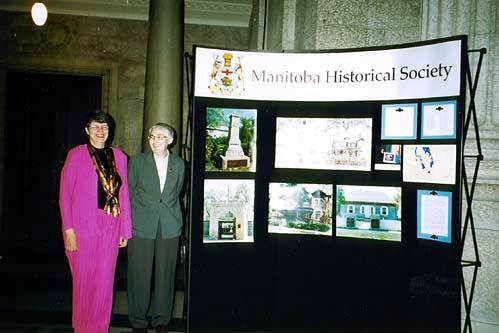 In the end, the relevance and vibrancy of the Manitoba Historical Society will be determined by you, its members. I can promise that I will do my best to move the MHS forward, but I count on each and every one of you to join me in making our Society better! Please feel free to contact me with your thoughts and ideas. My daytime telephone number is (204) 474-7469. I cannot promise to always take your call but I will call back if you leave a voice mail message with your name and telephone number. I use email a lot - my best ideas come in the middle of the night when I cannot call someone to share them - so I encourage you to write to me at president@mhs.mb.ca. Best wishes for the rest of the summer. As of the beginning of July, the Society has a new office at 304-250 McDermot Avenue, in the Exchange District, just a few blocks west of our former location. After spending over a decade in the Grain Exchange Building on Lombard, the Executive decided a move was in order. There were many reasons for the move, the most important being that we wanted to find a less expensive location. Our landlords, who had raised the rent for each of the last three years, proposed to raise it for each of the next three years. By contrast, rent at our new location is fixed for the next three years, at a level about two-thirds of our former rent. The upside is that we will save a substantial amount of money although, in the first year, the savings will be used to purchase furniture to equip a new space for our library. With a number of projects in the works, most significantly our new Dalnavert Visitors Centre, we felt that we needed to conserve our modest resources wherever possible. The office is filled with boxes right now but we expect to have everything in order by September. The open-concept office - a former sewing factory that was partitioned into office space a few years ago - features hardwood floors and no interior walls, so it looks larger than our former space, though they are about the same size. Once furnishings are in place, visitors will enter the office into a reception area that leads onto an inviting space for our library (to be christened the Nix Memorial Library, in recognition of recently deceased MHS member and benefactor, Edwin Nix). Behind the library, toward large windows overlooking Arthur Street, will be a meeting and work space, next to which is an "office nook" for Jackie Friesen, our Office Manager. The Exchange District has undergone considerable renewal during the past few years, and is becoming a vibrant social and cultural hub. We hope that, in some small way, our move will contribute to the rebirth of this historic area. Telephone, fax, and email addresses remain unchanged. The full mailing address is available here. Work on the Visitor Centre at Dalnavert continues to steam ahead. The building is largely roughed in and it is now possible to see the shape of the rooms and the impressive entrance hall and foyer. The most spectacular thing about the Visitor Centre is the view from the Orientation Room toward the house with the verandah as the centre piece. This view is going to make that room a very popular choice for meetings and social events. The skylights which will illuminate the display cases in the Gift Shop have been installed and one can get a small idea of how effective that overhead light is going to be. On July 8 the Dalnavert Management Committee members met with Wins Bridgeman and Gerry Humphreys, the project Architect and Project Manager, to walk through the building. Present were Stephanie Middagh and Jim Blanchard, Committee Co-Chairs, Kathleen Richardson, Rodney McDonald, Lisa Hardess, Monique Woroniak, Gordon Harris and Sarah Piercy all attended the meeting and were suitably impressed by the progress that has been made. Also present was Margaret Kentner. Ms. Kentner will be helping design and operate the new gift shop, as a volunteer. She brings considerable experience, gained over many years in the gift shop field, to this task and we are very fortunate to have her help. Mr. Harris is our newest Committee member. A professional chef with broad experience in catering, he will be able to advise us on among other things the rental of the Orientation Room. He has already made some useful suggestions about the design of the kitchen. Even though the Museum is currently closed Tim Worth and Nancy Anderson are working to prepare everything for the first year of operation with the Centre in place. New programs and exhibits, the new gift shop, a grand opening with the dedication of the time capsule are all on the drawing board and progressing well. Dalnavert summer programs are going on as usual, using space made available by the Crafts Museum. A recent event at the Musuem saw local school children who had created paintings on sheets of plywood hand over their artwork to Dalnavert. These wonderful artworks are now displayed on the fence at the construction site. 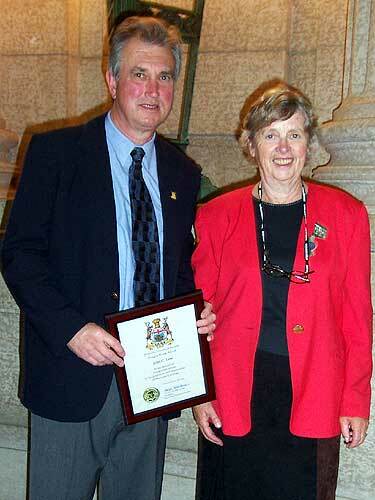 Adeline Kruse, a MHS member, died on July 5 at the age of 78 in Winnipeg. 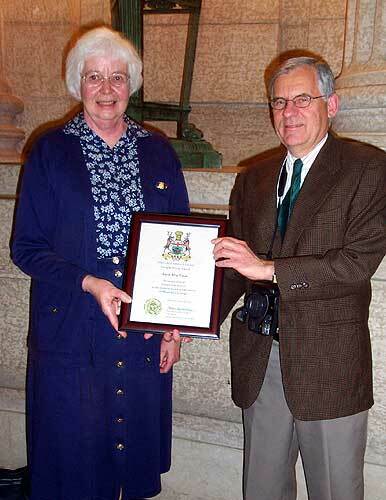 She retired from the Manitoba Parks Branch in 1986 and traveled extensively especially after that time. She attended some MHS events over the years. The AGM was held on 5 June at the Warren Hall. Click here for an up-to-date list of Centennial Farms. The City of Winnipeg and the Province are each providing $9,400.00 to Heritage Winnipeg to prepare a study on the possible restoration Barber House at 99 Euclid Avenue in the north Point Douglas area. Renovations in the 1980s were never completed and the building was severely damaged by fire in 1993. McDougall House was moved from Lorette to Place St. Norbert Interpretive Centre on Pembina Highway next to the St. Norbert Market. The house was originally built in 1899 as the home of Daniel and Virginie McDougall. Exhbits on the history of St. Norbert are on display in the house this summer. The house is open this summer from noon to 5 p.m. from Wednesday to Friday and on Sundays. It is also open from 10 a.m. to 5 p.m. on Saturdays. 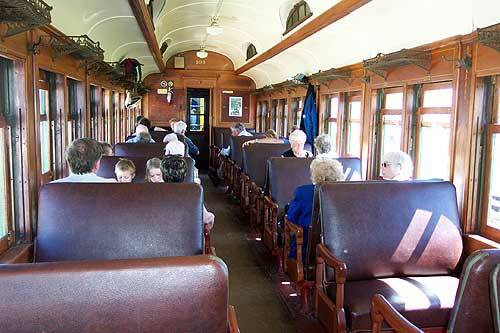 The interpretive centre is operated by Heritage St. Norbert. Winnipeg Embroiderers' Guild Exhibit opened July 15 at the Manitoba Museum. The magnificent display features pieces of embroidery from the 30-year history of the Winnipeg Embroiderers' Guild. Examples of work from current and former Guild members will be shown. Many different pieces of embroidery have been created over the years, including needlepoint, cross-stitching and surface embroidery. 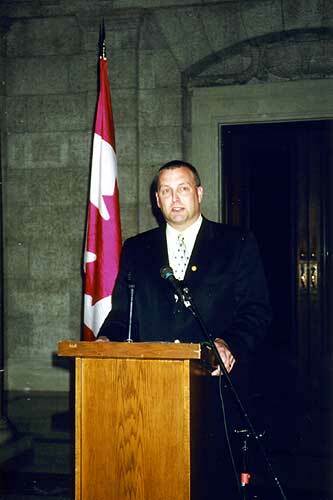 The City of Portage La Prairie Heritage Advisory Committee has recommended that the house of Portage La Prairie MLA David Faurschou, located at 102 - 1st Street, be designated a historic site. The house will now be referred to as the Fawcett Gowler Taylor House after the prominent citizen who originally built the house in 1913. The Herald Leader Press notes that this is the first house the committee has designated since it was set up in 1992. Members of Red River Metis Heritage Group have been traveling on homemade horse-drawn carts retracing an original ox-cart route from St. Norbert to San Clara, near the Manitoba-Saskatchewan border. Portions of the trails are on current provincial highways. However members of the group also have sought permission to cross farmers' fields. Members of the group made history come alive as they spoke to pupils in grades 5 and 6 in Oakville School. It is estimated that at least 150 people took part in the long trek from St. Norbert to San Clara. The Treherne Times reports that His Excellency Archbishop Emilius Goulet of St. Boniface led a Special Mass on June 19 to celebrate the 125th anniversary of the Parish of St. Leon. A plaque located at the front and right side of the church was unveiled with an inscription to mark the special event. 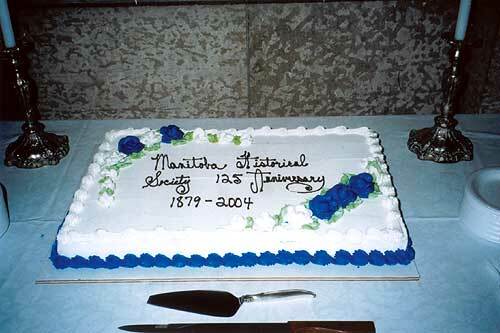 An anniversary supper was held in the community hall. St. Leon was the first parish in the Pembina Mountain region. Later other parishes were established in the region: Somerset (1879), St. Alphonse (1883), Notre Dame de Lourdes (1891), Bruxelles (1892), St. Claude (1895), Haywood (1909), Swan Lake (1919), St. Lupicin (1920) and Mariapolis (1903). 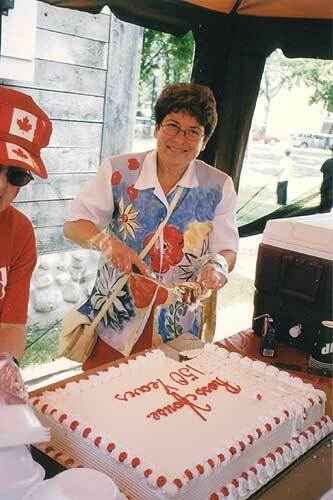 The Dairy Museum of Manitoba was officially opened in St. Claude in July 2004. 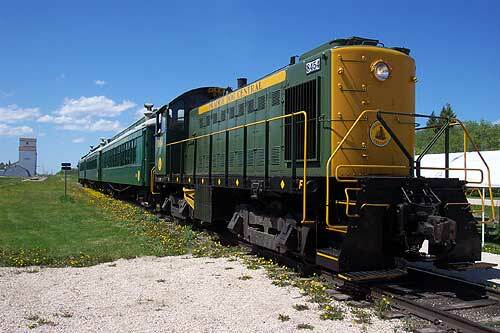 It is the only museum of its kind in Manitoba.The 2400 sq. ft. museum presents in minute detail through artifacts and photographs a history of the dairy industry in Manitoba. The Trappists and their involvement with the dairy industry through the years receive some attention. There is information on breeds of dairy cattle. Various kinds of dairy equipment used in St. Claude and elsewhere is on display. There is even a display of 72 kinds of barbed wire dating back to the 1870s. Preparations for the museum date back to 1995. Dedicated committee members persisted to make the project a reality. The people of Souris celebrated the centennial of the Souris Swinging Bridge on July 3 as part of the Canada Day celebrations. On July 6 the community was informed that Canada Post will soon be issuing a stamp to honour the swinging bridge. A letter writing campaign requesting this special recognition last November has been successful. 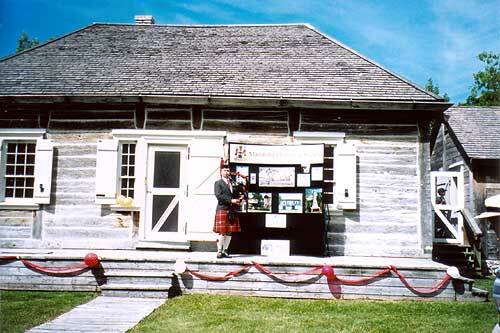 On July 1 Ross House Museum celebrated Canada Day and also the 150th anniversary of the building of Ross House and the 125th anniversary of the Manitoba Historical Society. With the assistance of a grant from the City of Winnipeg, a permanent flagpole was purchased and installed near the house. At about noon a piper led people on a walk around the outside of the house. 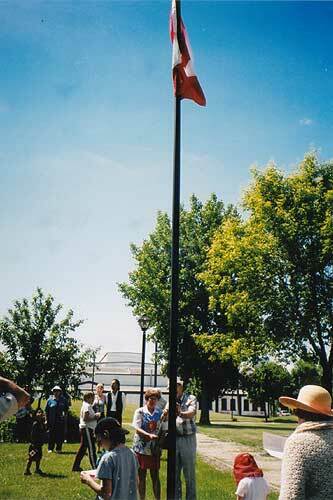 Judy Wasylicia-Leis MP and Victor Sawelo, Ross House Museum Manager, raised the Canadian flag. Community volunteers barbecued bison burgers and hot dogs for a large crowd of neighbours, MHS members and friends. People enjoyed a piece of birthday cake and musical entertainment during the afternoon. and I encourage all citizens to join in this heritage celebration by visiting their local heritage sites to journey back in time and experience the important and diverse history that has contributed to shaping our vibrant province. 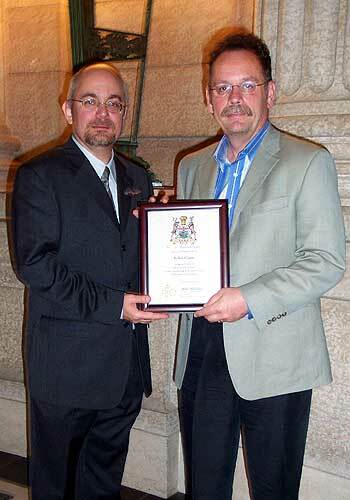 Steve Place and Peter Bjornson hold provincial proclamation of "MHS Day"
I think the reason I have been asked to say a few words to you today on the topic "Reflections of the MHS" is that I probably have the distinction of being a member of the Society longer than anybody else. I don't have a record of the date that I became a member and when I made enquiries at the office a few years ago I learned that there is no record there either. However, I do remember that l was attending university (United College) at the time, and as I graduated in 1950 and my collection of the Society's Transactions begins with the 1950 edition it seems reasonable to assume that I joined in 1949. I'm not sure how I even found out about the Society as no one in my family and none of my friends were members, however I began attending the monthly meetings and quickly became "hooked". At that time the meetings were chaired by William Douglas, president from 1948 to 1951, and were held on the second floor of the Legislative Building, right over the main entrance, in what I am told is now called the Manitoba Room. 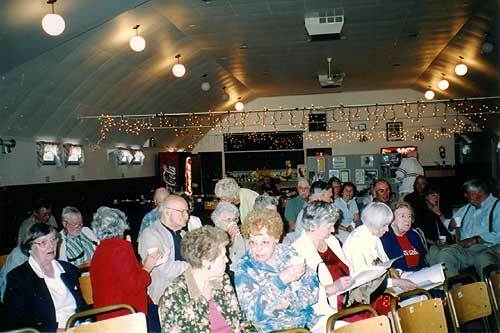 I don't know how many members we had then but the meetings were usually well attended. I remember being surprised to find that no other students were present. It seemed to me that history students in particular would both enjoy and benefit from the meetings, but I guess they didn't know what they were missing. 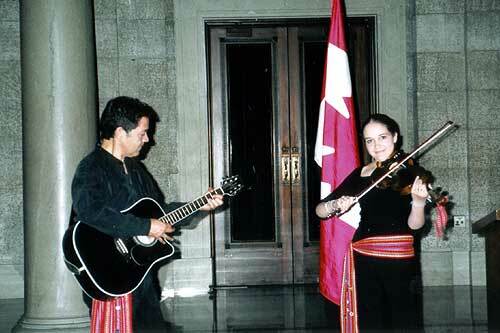 The highlight of every meeting was a talk on some aspect of Manitoba or Canadian history. For me, the best part was the time following for questions and comments. I especially remember Father D'Eschambault who never missed a meeting and would invariably have a comment pointing out some historical fact that the speaker had overlooked and which, in some cases, would alter the conclusions presented in the talk. 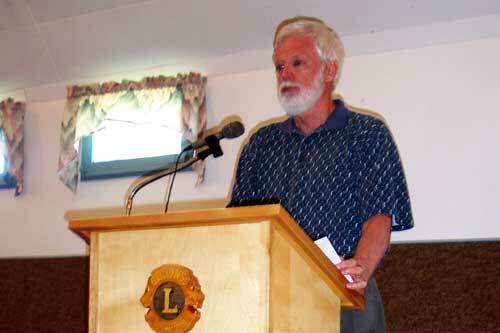 His detailed knowledge of Manitoba history was truly amazing. Another member who never missed a meeting was Lillian Gibbons, the well-known author of "Stories Houses Tell". Wearing one of her distinctive hats she would sit close to the front taking notes in her notebook. The next day there would be an article under her byline in the Winnipeg Tribune, reporting on what had happened at the meeting. After the Legislative Building was no longer available, we met for several years in the basement auditorium of the Monarch Life Building at 333 Broadway, today the Workers Compensation Building. Other locations included the auditoriums in the Museum of Man and Nature and the Centennial Library. The library was not very satisfactory as it closed at 9:00 PM and we had to get out whether our meeting was finished or not. In later years I was disappointed when, for various reasons, attendance fell and regular meetings were replaced by occasional programs. However, my interest and membership in the Society continued, even when work took me to Vancouver in 1970. On my return to Winnipeg in 1975 I soon resumed an active role in the Society and was honoured to serve as President from 1978 to 1980. 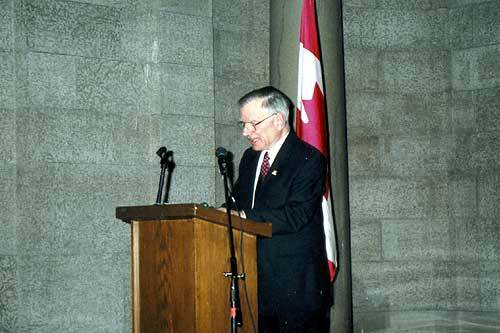 The high point of my term of office was the Centennial Dinner, a grand event held at the Winnipeg Convention Centre on May 26, 1979 with Pierre Berton as guest speaker. Anne and I were seated at the head table on either side of our distinguished guest who, on discovering that Anne was a registered nurse, was able to have a most interesting conversation with her about kidney stones. 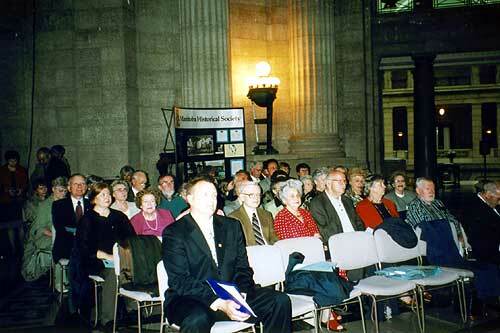 Today, 25 years after that Centennial Dinner, 55 years after I became a member, and 125 years after the Manitoba Historical Society was incorporated I am delighted to report that both the Society and I are very much alive and well. As we both face the challenges of the years to come it behooves us to occasionally look back to see where we have been and what we have accomplished in the past. I hope that you have found these reflections of interest. Thank you for your attention. Congratulations to Matthew Richard Enns for winning the inaugural MHS C. N. Bell Award for receiving the highest mark in 11.144 History of Canada at the University of Manitoba. The Award commemorates the life and work of Charles N. Bell who was President of the MHS from 1889 to 1891 and again from 1913 to 1929. The award is named after Douglas Kemp, MHS president from 1959 to 1961, a dedicated member who volunteered his services to the Society over many years. At the 125th Celebration we honoured three recipients who have provided outstanding service to the Society for over ten years: Bob Coutts as co-editor of our journal Manitoba History, Dr. John Lehr as the primary organizer of our field trips, and Anne MacVicar as the Chair of the Centennial Farms Committee. Click here for this feature on the excellent museums of rural Manitoba, as explored by Maria Zbigniewicz.